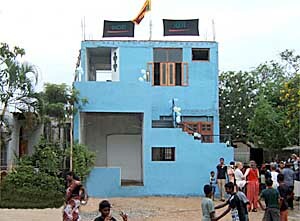 The purpose of this project was to extend a resource centre, by adding a second storey, providing a child friendly environment for the children of the shanty town community in Uswatte, giving them facilities for additional studies, to do their homework, use the library, and play indoor games such as chess and carrom. 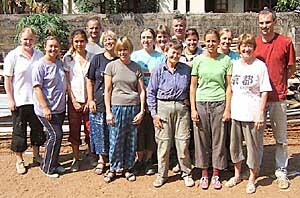 In addition to working on the building the volunteers were also taken to see SERVE's work for the poor in the area, as well as on several local and regional sightseeing trips. "I had paid my money, bought my ticket when suddenly I started to panic -- how would I cope with heat, the humidity, the physical work, living communally, and being surrounded by poverty. This was closely followed by what should I take to wear and is my rucksack big enough and can I carry it! Suddenly I was on my way, meeting the other volunteers (12 females and 3 males, aged from early twenties to mid sixties -- me being one of the oldies). We arrived at the project on Monday and were met by parents of the children who attended the centre. We were then divided into 3 groups and taken to see their homes. The young woman in her early thirties had three children, two attended the centre -- her husband was a labourer and she picked up work as and when possible. She was so proud to have been chosen to show us her home. It was a small shack (approx 15' x 7') of rough planks -- earthen floor -- no windows, electricity, running water or sanitation, it was divided into two areas. The place was hot and dim. On the floor just inside the door was her 17year old son lying in a wooden cot on a clean cotton blanket on the earthen floor; he was unable to sit or stand and just lay there, he spent his days lying on the floor! He was well cared for and loved. 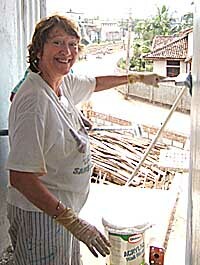 There were very few personal possessions most had been damaged when the tsunami flooded her home. She cooked on an open wooden fire on the floor in a kitchen area fetching the water from a nearby communal tap. The toilet was the beach as it was for all the families in the shantytown. We were shown around other homes -- some had electricity and some had soft furnishing but none had sanitation or running water. I realised then just how important the Resources Centre was in helping to change and improve the lives of these children, now and in the future. We started work on Tuesday, sifting sand, barrowing it from A to B, hoisting sand and water to the first floor, 'our floor', mixing sand and cement and learning to render the walls the Sri Lankan way. By the end of the first week I had got the hang of it and got my NVQ from the foreman! The team all worked hard and pulled together -- it was great. 16 children's paintings were chosen to be faithfully reproduced on large boards -- these were to be the wall murals, plus an 'AidCamp special' signed by all of us. I thoroughly enjoyed doing this, it was relaxing, and it felt good. The results were great -- it was the first painting I was to 'exhibit'. The final week was hectic- everyone working at full steam. We were painting the ceilings and walls with paintbrushes stuck in the end of poles -- paint did tend to get everywhere -- faces, floors, hair, etc. The workmen were putting in windows, hanging doors, finishing of walls, etc, everyone in a state of anticipation. Then finally we put the murals on the wall. The opening ceremony with the various religious blessings was most interesting and I was so proud to be part of a good team that had helped to transform the first floor into an attractive learning environment. The children's main reaction was excitement -- looking at their paintings and seeing their new area -- smiles on all faces, some wanting to touch and hold your hand, all very moving. I was both humbled and proud by the gratitude expressed by the staff of SERVE for our achievement." "Positive enjoyment with a positive purpose." "On an AidCamp you can make a real difference to people's lives and experience a foreign culture at the same time." "The help and support of the local staff really made the project special as they left no questions unanswered and never refused help, volunteered help even when not expected at all." "I came to give to the kids and take for myself. I have taken much more than I have given." "Stretches your muscles, expands your mind." "Fanstastic experience. Help someone and have fun." "A fantastic and very worthwhile experience, where the local children really benefit. I had a wonderful time!" "A wonderful opportunity to see life in another person's eyes and value what you have and what you are capable of achieving." "It gives a very different perspective and you see the country from different points of view." "I came to help children, but the children made me feel more special than I ever thought possible. I feel so lucky to have taken part in such a wonderful project." "AidCamps was a brilliant experience. It gave me the chance to meet like minded people and to work as a team to produce a wonderful resource for the good of people less fortunate than ourselves." "It was great to see the joy on the children's face when the saw the center opened. So worthwhile." "It was a very worthwhile and memorable experience." "I had a much better picture of the Sri Lankan culture than I would have had from a holiday, and it was lovely to leave something behind to help some children who did not have a good start in life." "Positive enjoyment with a positive purpose." "On an AidCamp you can make a real difference to people's lives and experience a foreign culture at the same time." "The help and support of the local staff really made the project special as they left no questions unanswered and never refused help, volunteered help even when not expected at all." "I came to give to the kids and take for myself. I have taken much more than I have given." "Stretches your muscles, expands your mind." "Fanstastic experience. Help someone and have fun." "A fantastic and very worthwhile experience, where the local children really benefit. I had a wonderful time!" "A wonderful opportunity to see life in another person's eyes and value what you have and what you are capable of achieving." "It gives a very different perspective and you see the country from different points of view." "I came to help children, but the children made me feel more special than I ever thought possible. I feel so lucky to have taken part in such a wonderful project." "AidCamps was a brilliant experience. It gave me the chance to meet like minded people and to work as a team to produce a wonderful resource for the good of people less fortunate than ourselves." "It was great to see the joy on the children's face when the saw the center opened. So worthwhile." "It was a very worthwhile and memorable experience." "I had a much better picture of the Sri Lankan culture than I would have had from a holiday, and it was lovely to leave something behind to help some children who did not have a good start in life."